Summon: A friendly creature with 5 or more power Battles an enemy creature. Fighters Guild Steward is a rare Strength creature card. It is part of the Houses of Morrowind expansion. "You have problems? We are going to solve them." "There won't be a problem anymore." 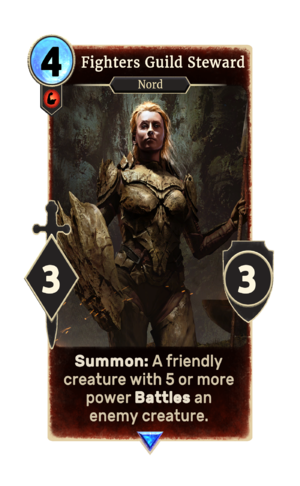 This card likely depicts Eydis Fire-Eye, who first appeared in Morrowind as the Fighters Guild steward in Balmora. This page was last modified on 2 March 2019, at 00:12.